Catherine in Alexander McQueen wedding dress with her Maid of Honor and sister, Philippa Middleton. Photo: Getty Images. Word is that Catherine worked closely with Sarah Burton in creating a dress that combined modern with traditional. Catherine chose House of Alexander McQueen for its excellent craftmanship and artistic vision. Check back for Jydonne Bynum-Breiterman’s review. 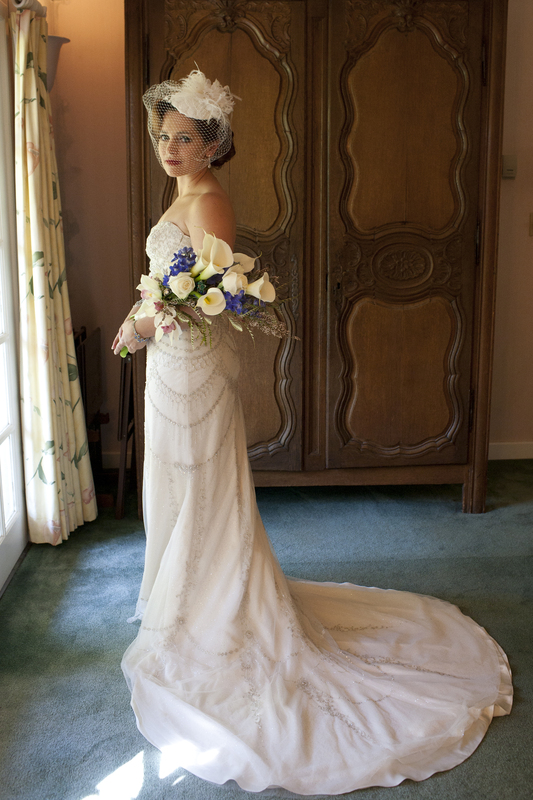 Jydonne Bynum in her 1930s-style wedding dress by Lazaro. Photo: Amaranth Wedding Photography. The fashionable Jydonne Bynum-Breiterman has been closely following Kate Middleton and her style since the engagement announcement last November. Having just planned a wedding herself, she’s got her finger on the pulse of current wedding chic and definite ideas about what we all might see come this Friday, April 29. I spoke with Jydonne via e-mail about her predictions for Kate’s dress. The dress, Jydonne points out, will have to have a large enough presence to be seen in the vast space of Westminster Abbey.” For this reason,” she says, “I think the bottom of the gown, although low waisted, will have a bit of volume.” Jydonne predicts there will be a train, but nothing like the seemingly endless train Princess Diana sported for her 1981 wedding to Prince Charles. Jydonne will rise at 4am this Friday to watch the festivities live. Just like she did as a young child with her grandmother 30 years ago, when Princess Diana emerged from her carriage. “I can’t wait,” she says. Check back with Over Dressed for Life next week for Jydonne’s Royal Wedding Review. Jydonne Bynum-Breiterman has a BFA in Art History from the University of Oklahoma. She currently lives in Washington, DC with her new husband and she’s working with Oatlands Plantation in Leesburg, VA helping to archive their antique clothing collection. In addition, she’s setting up her own fashion blog (http://www.vintageleisure.com/) and researching a masters programs in fashion. Catherine Middletons Coat of Arms. Image courtesy of the Press Association. 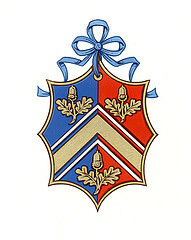 The Middletons now have a Coat of Arms and a lovely one it is. A Coat of Arms is a crest or set of images meant to identify an individual, family, corporation, or organization. The images chosen reflect the values and traits of the bearer. In Britain, The College of Arms regulates the dispensation of such an honor. (Not just anyone can get one, although, Donald Trump did). Protocol dictates that the request be submitted by an individual on behalf of the family. Kate’s father made the request and the family worked closely with The College of Arms in the creation process. The acorns symbolize the three Middleton children – Catherine, Philippa, and James. The thin white chevrons represent the mountains and outdoor activities the family enjoys together. Blue and red are the colors of the United Kingdom flag. Coat of Arms can be very busy with large animals and clashing colors, but the Middletons have created something simple and elegant. Using just a few images that are appealing and meaningful, their Coat of Arms says it with style. So how might the Middletons don their Arms? Most likely in the form of a signet ring. Apparently, it’s also acceptable to display one’s Arms on formal wear for special occasions. Such as, perhaps, a wedding? Fascinator created by Sarah Padgham from a silk blouse. Photo: Richard Aiello. This past weekend I attended St. Vincent de Paul of Alameda Artist-in-Residence Exhibition. SVDP offers local artists the opportunity to create art from unwanted donations. 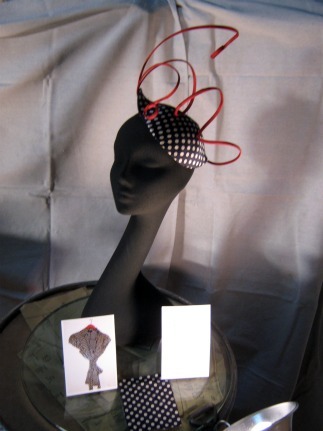 In 2009 they added fashion and the 2011 Fashion Artist-in-Residence is milliner Sarah Padgham. I was really impressed with what Sarah created out of old clothes. Click here to read my Examiner.com column on Sarah, her hats, and the exhibition. Catherine Middleton is not the first princess bride to keep her wedding dress a secret. Lady Diana Spencer also kept her frock under wraps, which required fake clues given to the press, a code name and around-the-clock security. 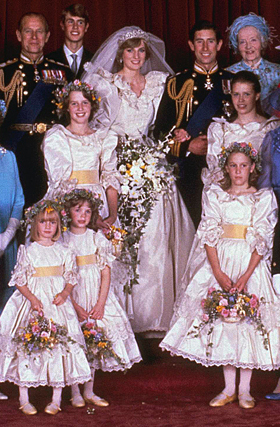 In 1981 Princess Diana's wedding dress and all her bridesmaids dresses cost a mere $1700. The now iconic dress was designed by the London design team, David and Elizabeth Emanuel. Apparently Diana had seen one of their blouses and asked them to do a few sketches. The dress itself is early Victorian inspired with large puffy sleeves and a full tulle petticoat. It’s made of cream silk taffeta with bows, lace, and pearl detailing. Today the dress is exhibited around the world. During the summer the dress returns to the Spencer Althorp Estate for display. The Emanuels designed the frock thinking fairytale princess and happily ever after. They also needed to create something that wouldn’t get lost in the expansiveness of St. Paul’s Cathedral. Hence the train … 25 feet of train. So what will Kate’s dress be like? Something modern no doubt, perhaps sleek without a lot of frills. Will she wear white? Diana wore the Spencer tiara – Kate doesn’t have one of those but perhaps a tiara will be the something borrowed. Or she might go with her favored fascinator. The speculations are endless and all part of the fun leading up to the big day. What do you think, readers? What would you like to see Kate wearing? 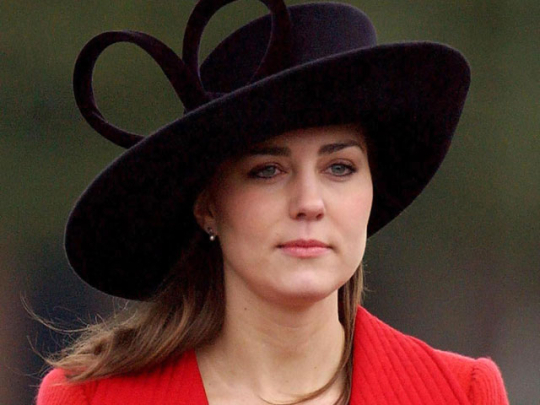 Kate looks good in a hat but not sporting a hunting rifle. Her grandmother, Dorothy Goldsmith (a carpenter’s daughter), was called Lady Dorothy and thought to be a snob. Kate has never been invited to spend Christmas with the royal family. Kate was bullied at her boarding school. The wedding couple has requested that in lieu of gifts, donations be sent to an anti-bullying charity. My fave – Kate is allergic to horses, which means limited hunting for her. Kate loses major style points with me for going on hunting trips with the royal family. Hunting as well as any other inhumane treatment of animals is not stylish. Former French model and now author Ines de la Fressange is the perfect example of a chic older woman. 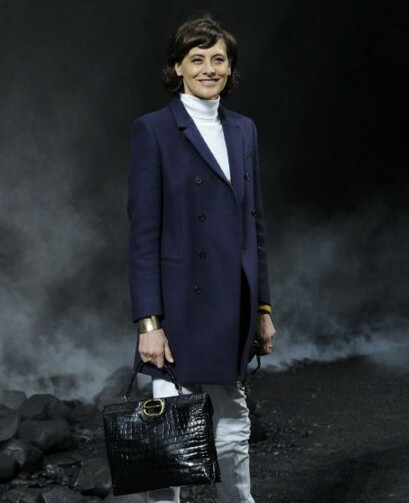 At 53 she’s recently returned to the catwalk and she’s been nominated Most Stylish Woman in Paris. Way to go, Ines. Fashion for women-of-a-certain-age is tricky. One doesn’t want to look like a teenager, but the matronly look middle-aged women tended toward 50 or even 30 years ago, isn’t going to cut it for the boomers.